If you’re a fan of the great outdoors but the thought of spending a night in a slightly mouldy white box has you quaking in your Hunter Wellies, then you’re not alone. 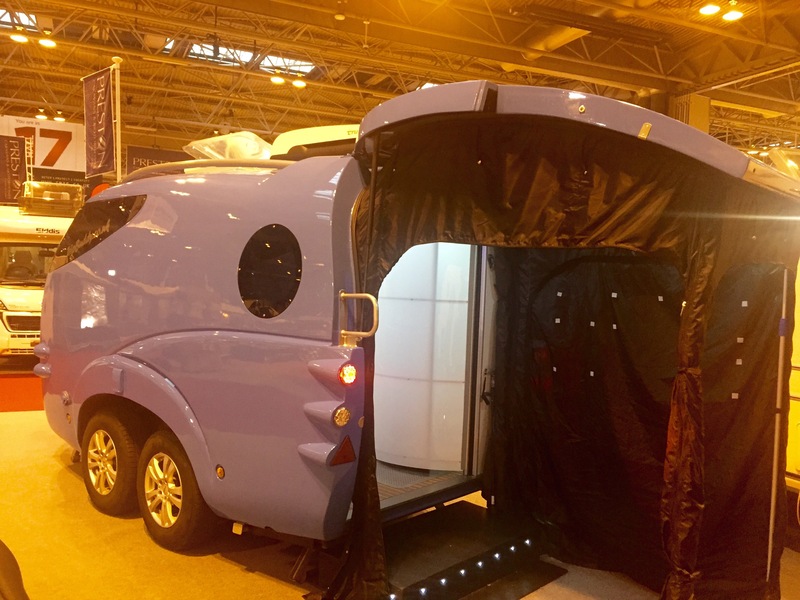 With ‘glamping’ on the rise, it’s about time that someone injected a little bit of colour and style into the camping and caravanning world. Well, prepare to kiss goodbye to all of your preconceptions because now you can go from unhappy camper to ultimate glamper with TripBuddy! 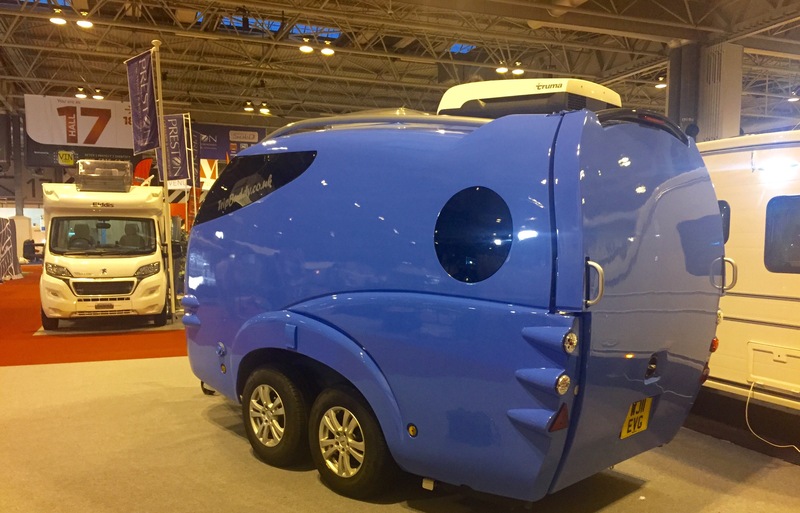 A very imaginative name, I know, but Blue the British designed and made TripBuddy caused quite a stir at the NEC Motorhome & Caravan Show in Birmingham earlier this month, which was where we first met. 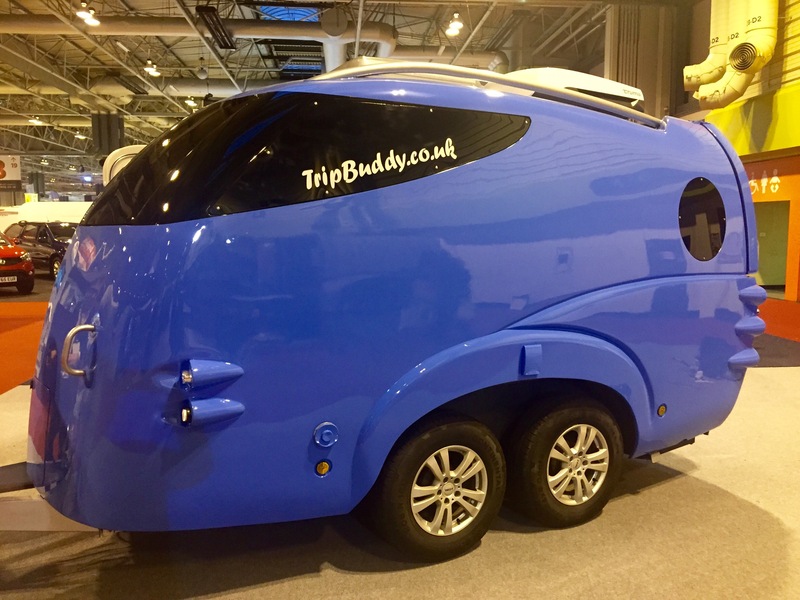 The beauty of TripBuddy is that it had much more personality than anything else on show at the NEC. As you can see below, the interior is completely different to the traditional, slightly dingy, dowdy, dated caravan interiors we may be used to. 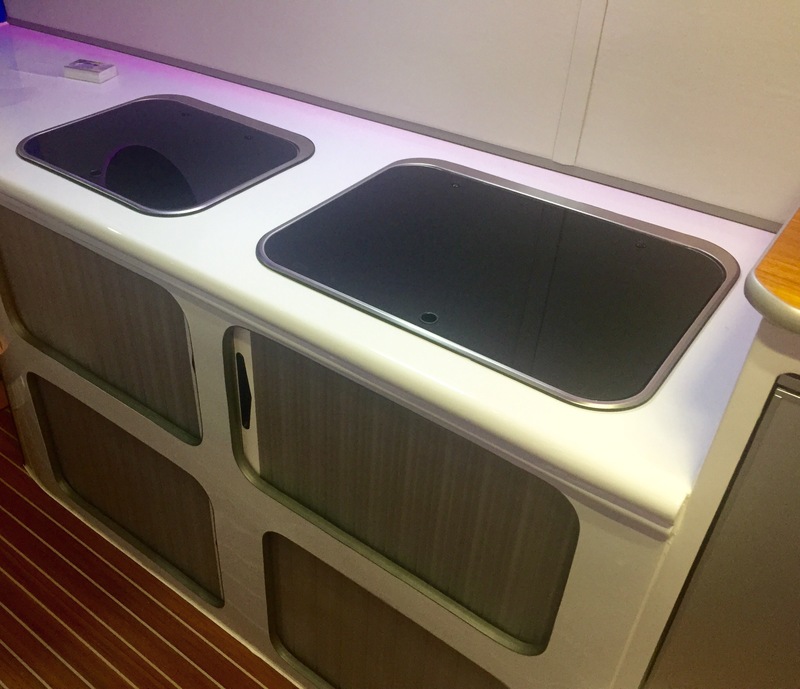 It’s designed to be like a yacht on the inside, and I believe TripBuddy worked with Sunseeker to develop the interior. Due to this, all materials used are nautical, functional, easy care, water-resistant and, perhaps most importantly to some, they look good. Whoever said you can’t have both style and substance? One of my favourite aspects of TripBuddy is the ‘foldaway’ bathroom, which you can see above, on the right. Two opaque screens can be swung outwards to create a cubicle around the drain in the floor, and if you’re having a shower, you can even take out the toilet to give a little more space. 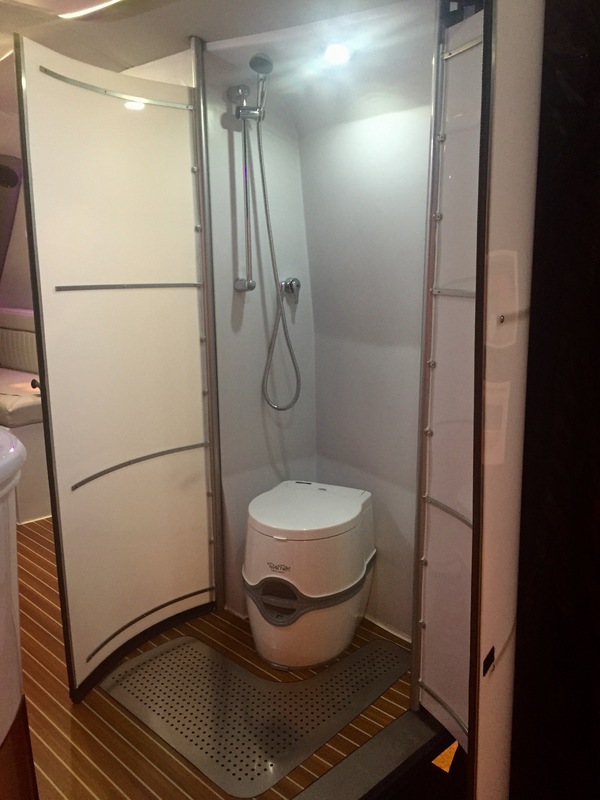 A wet room can be created without affecting any part of the structure, as there is no wood whatsoever in the construction of TripBuddy. What’s more, there are rubber trims round the bottom of the screens to prevent water escaping outwards. The layout of the little bathroom is such a brilliant way of using a tiny area to its full potential, and this quality extends to the rest of each TripBuddy. There is loads of storage space, and because each TripBuddy is handmade to order, it’s possible to work with the team to customise the interior to your own specifications. 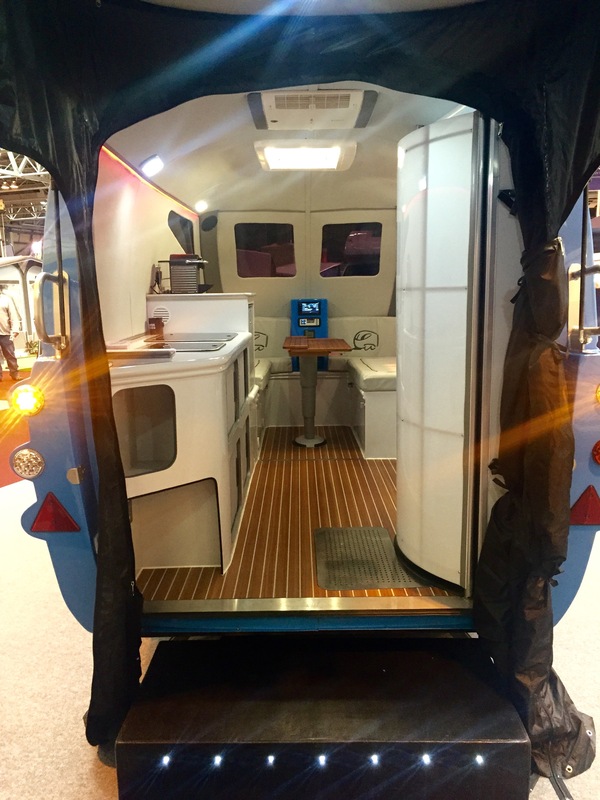 As you can see below, Blue has a sink and three hobs which can simply be hidden away by pulling down the dark glass covers, meaning that the counter space is usable all the time. And as you can see, the storage areas are covered by grey sliding screens, meaning that there are no cupboard doors which need to be swung outwards in order to access the items inside. This is just another example of how every aspect of TripBuddy‘s interior has been given care and consideration in order to maximise a minimal amount of space. Wait, I hear you cry, forget about storage: where am I to rest my weary head? 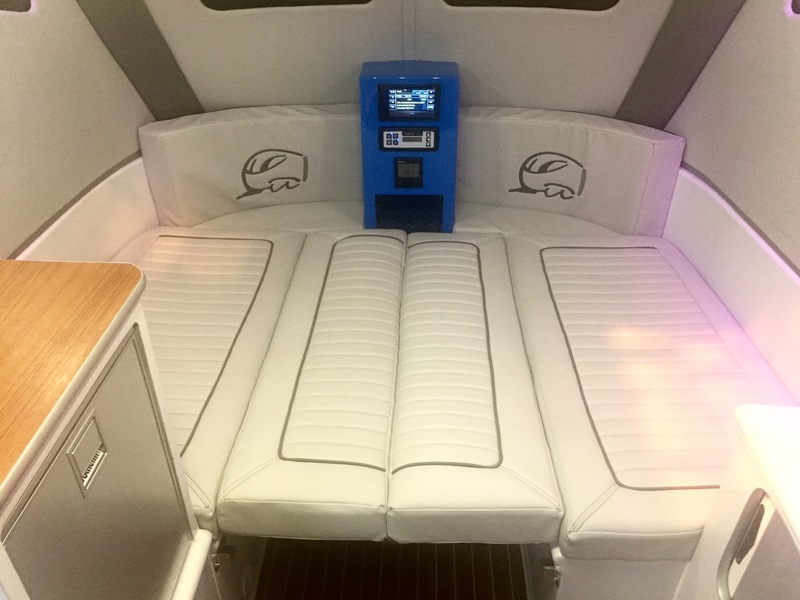 Well, the seating area below which, incidentally, also has storage areas under the seats, actually converts into a double bed around 6 foot 2 in length (however, there are customisation options for taller glampers!). You can see below how the table, which is on a telescopic stand, sinks down to create a flat surface upon which the squabs (apparently the name for these styles of cushion- every day’s a school day and all that) are placed to make a mattress. 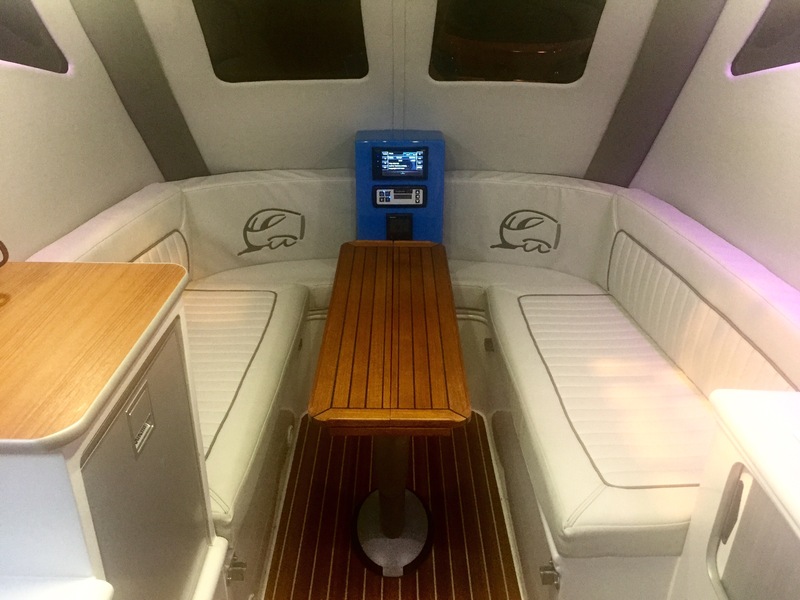 The great thing about location of the bed/seating area is that you can control the music, radio, lighting, water and heating through the console, above, all from the comfort of your own squab. Speaking of sleeping areas, TripBuddy has another little trick up its blue sleeve. As you will see below, the only access is through the back, which can be opened and secured with two metal poles. The door thus acts like an awning onto which two pup tents can be attached, which sleep another two each. 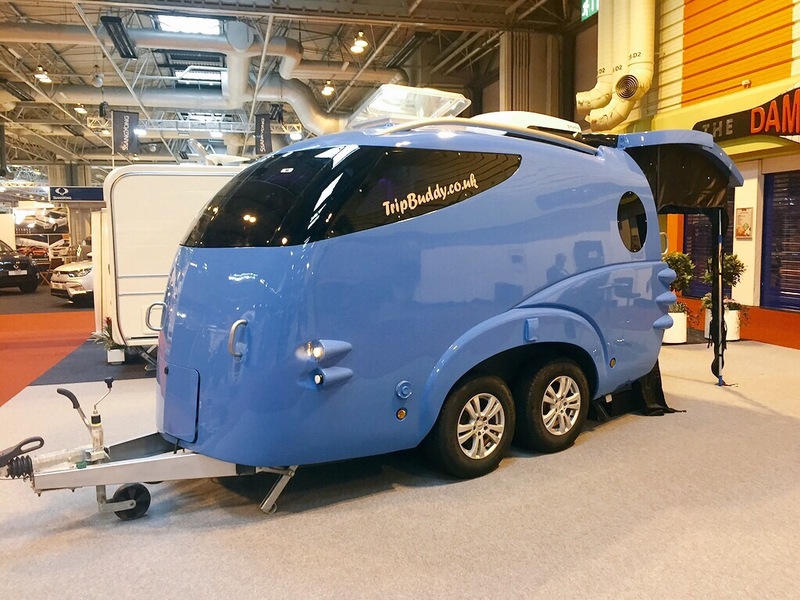 The great thing is that the temperature and sound can also be controlled throughout TripBuddy and the awning/pup tent area, which gives a sense of continuity to the space, meaning that those sleeping outside feel more included. So, enough about the interior and awning. Let’s get a little technical. 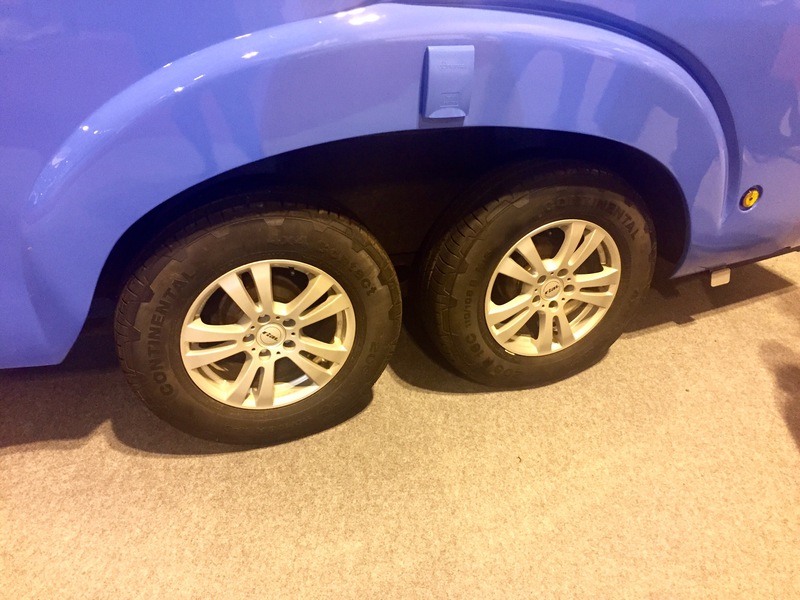 You might have noticed on the first few photos that TripBuddy is twin axle. Yes, twin. This may seem unusual given TripBuddy‘s size, however there’s method in the madness, as always. 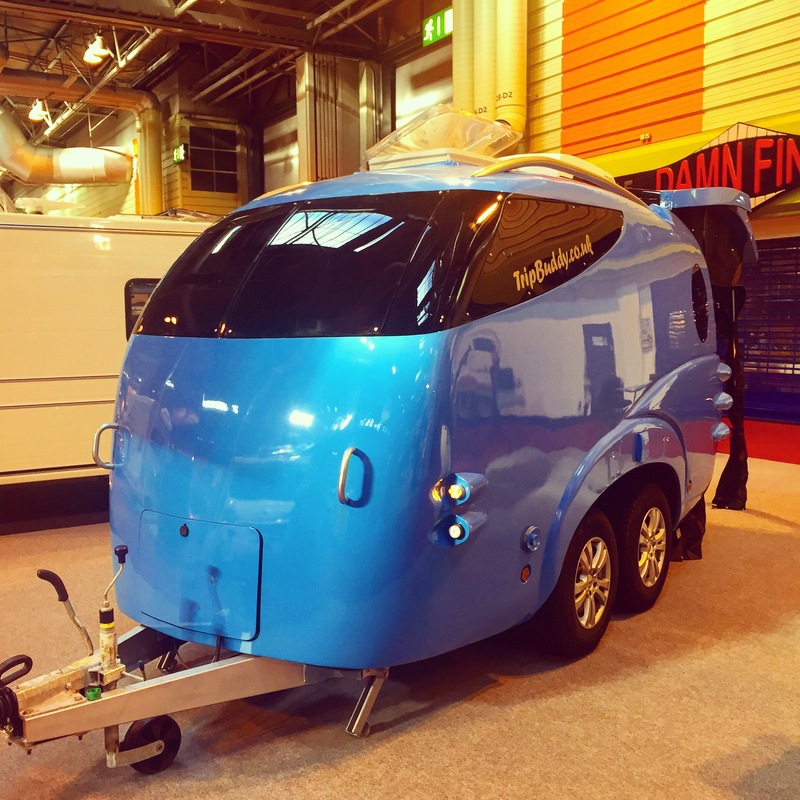 The beauty of Blue is that it’s a load carrier and can carry up to 500 kg inside while only weighing approximately 1100 kg itself, meaning that motorcycles or surf boards can be transported very easily. Being twin axle makes this possible. 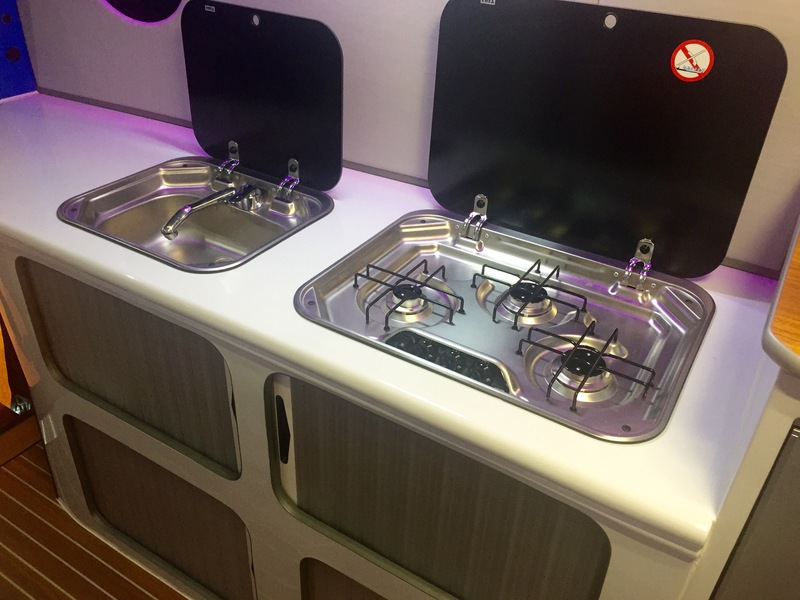 What’s more, the glass reinforced plastic body is absolutely seam-free and accordingly also leak-free, and being twin axle means that excess flex of the one piece moulding is avoided. Again, lots of method in the madness! Below you’ll see Blue being taken away after a busy six days at the NEC. 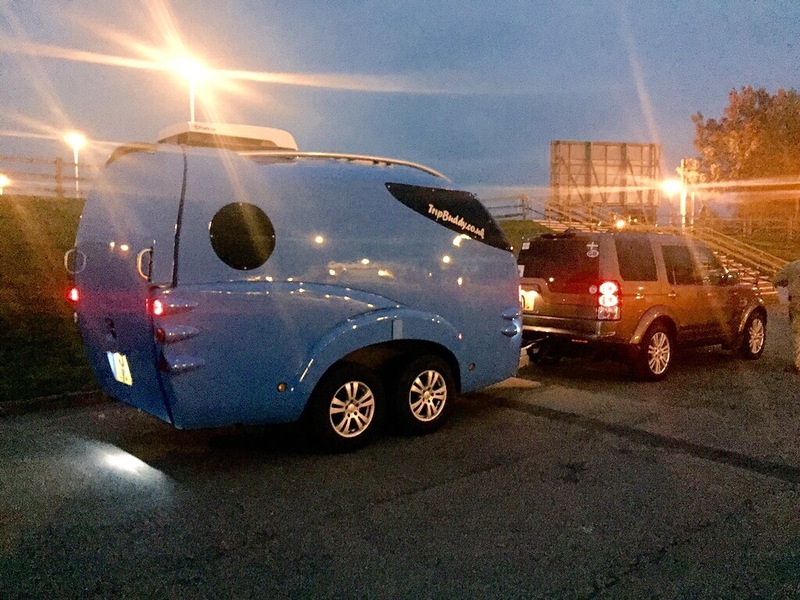 Although you can see a Land Rover towing it, given that its starting weight is 1100 kg, you don’t necessarily need a 4×4 in order to get your TripBuddy from A to B. A two litre, medium-sized family car would do the job. Oh, and your TripBuddy doesn’t have to be blue. You can visit TripBuddy’s official website here. 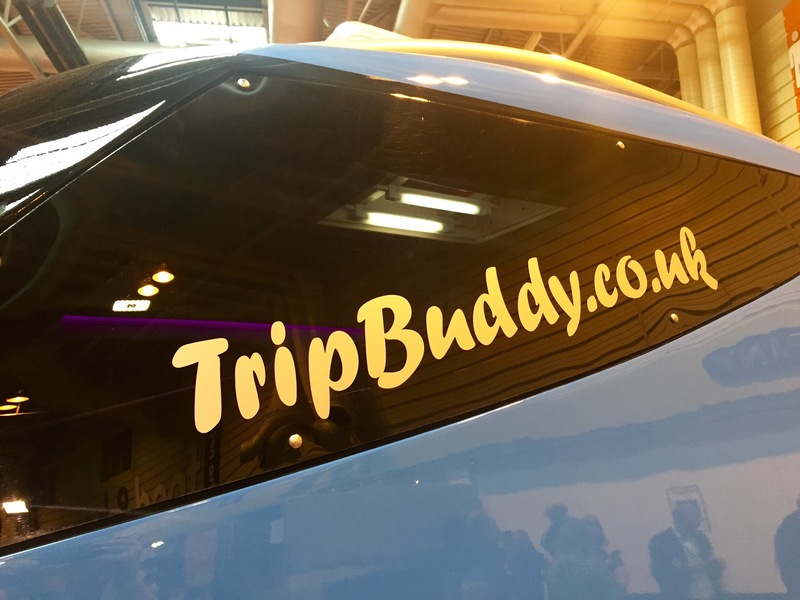 You can follow these links to TripBuddy’s Facebook and Twitter pages.